ALBANIA: China, the new old strategic partner? 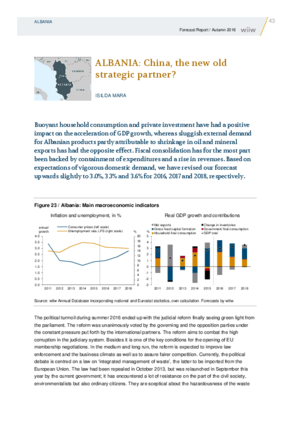 Buoyant household consumption and private investment have had a positive impact on the acceleration of GDP growth, whereas sluggish external demand for Albanian products partly attributable to shrinkage in oil and mineral exports has had the opposite effect. Fiscal consolidation has for the most part been backed by containment of expenditures and a rise in revenues. Based on expectations of vigorous domestic demand, we have revised our forecast upwards slightly to 3.0%, 3.3% and 3.6% for 2016, 2017 and 2018, respectively.